Daffodil Nancy loves Easter. She has been out collecting Easter Eggs all day and found a lot! Have you seen Daffodil Nancy’s Easter adventure yet? She gets help from Sunflower Sam and Snowdrop Sia. Will they find all the Easter Eggs they hope for? 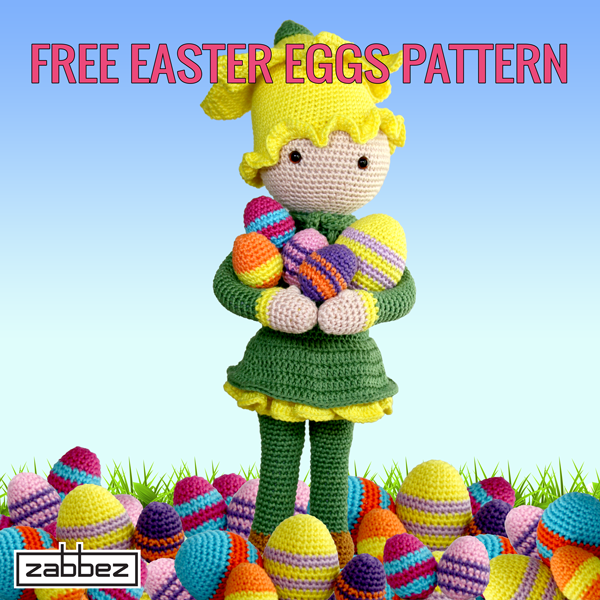 Find the crochet pattern for a Daffodil Nancy flower doll here. Weave the yarn tail through all remaining 6 stitches and pull tight to close. Finish off. Steek het draaduiteinde door alle overgebleven 6 steken en trek aan. Hecht af. Nähe die letzten 6M zus und vernähe alle Fadenenden. Coudre les 6 dernières mailles ensemble, coupez et rentrez le fil. Remata cosiendo los 6 puntos juntos y entreteje los extremos.